We're Off! £1.33 counter sheet leads the way in new year Machin printings. Although the 1st and 2nd class NVI counter sheets do get reprinted, there are so many other sources of these stamps - booklets, business sheets - and so many 1st class special stamps, that many Post Office branches don't need these basic values in sheets. 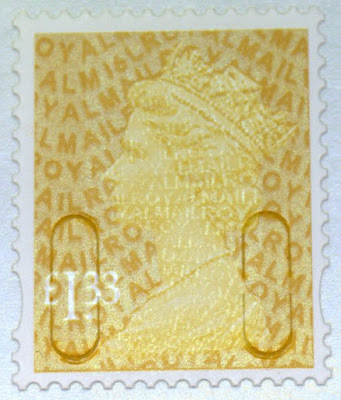 No surprise then that the first M16L printing to appear is the 20g Worldwide airmail stamp, the £1.33. This has been found with a printing date of 08/01/16, demonstrating that production is sailing quite close to the wind as these are out in Post Office branches already. Remember that De La Rue are moving stamp printing to Malta sometime this year so anything could happen! The sheets of 25 x £1.33 self adhesives went nil stock at the secure stock centre in early January. branches were replenished with the Regional Variations in recent weeks - nasty lick and stick jobs! Normal service was resumed this week - I received a couple of sheets of self adhesive £1.33's in my inward remittance today but didn't bother to look at the date printed on them. Thanks Richard - so, 'not quite in time'. But that should mean that collectors see more regional £1.33s in their mail and in kiloware clippings. Good news, though maybe not so much for users. At lease Royal Mail have the new values printed and distributed in advance. I was in Italy last year and tried to post a few postcards to friends in Asia. I was told by staff at the Italian post office that the tariff just changed (1 October) and they don't have the news stamps yet. Just checked & my stock are 8th January printing as well. My local PO received £1.33 England pictorials this week in their stock and were also told that the stock centre had no stock currently of the self-adhesive £1.33 stamps. That backing paper looks very plain. Are Walsall the only printers producing the new security backing sheet at the moment? The De La Rue counter sheet is on plain paper. Let’s hope the printers don’t mix and match paper stock. As an aside, more jobs going as The Royal Mail moves some of its work to Malta. Ridiculous!! Never let the truth get in the way of a good rant, Alan! This is nothing to do with Royal Mail and no Royal Mail jobs will be affected, unless you have a link which confirms your view? Ian, I think he's saying that UK jobs will be lost, not Royal Mail jobs. Surely when DLR moves printing to Malta, it will be at the expense of UK employees, or are they being moved to Malta as well? Although don't laugh too much, it happened with Maltese Buses a few years back when UK bus drivers were shipped out there on long term loans to bail out the failing operation. But I digress.... It will be interesting to see whether or not quality suffers. "In other words, there will be no more bank-note printing in Malta: that will switch to Gateshead and the identity, security and postage stamp operation will switch to Malta"